On Valentine’s Day this year, I fell in love. I didn’t expect to, you understand. It happened. Like one those clichés you never expect will happen to you. On Valentine’s Day this year, I fell in love. 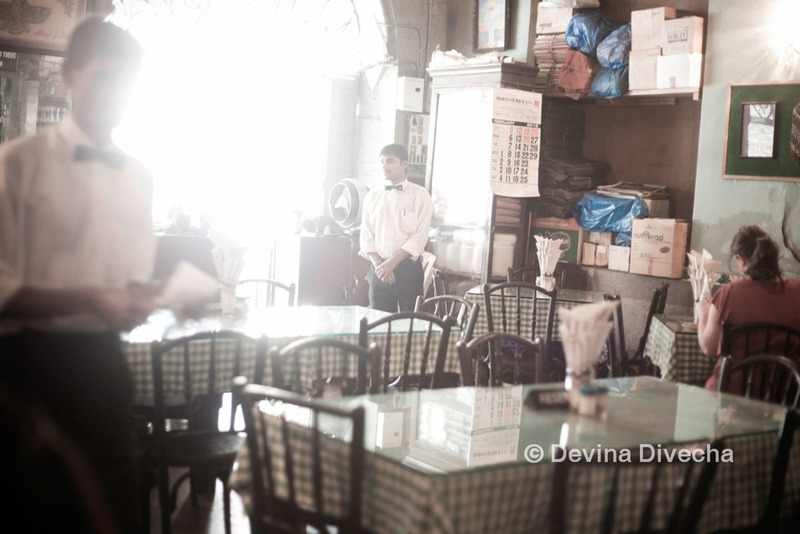 With a Parsi restaurant that has the support of the masses. 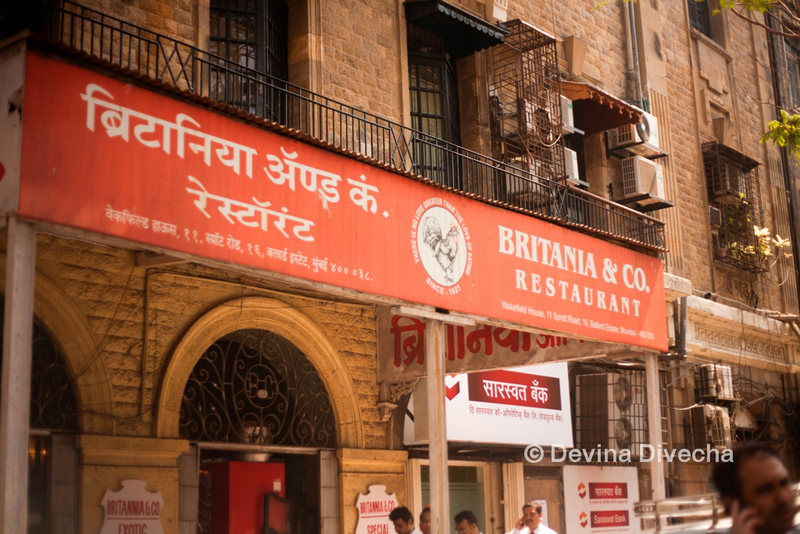 A sign outside Britannia & Co. says it offers “exotic Parsi and Iranian cuisine”. 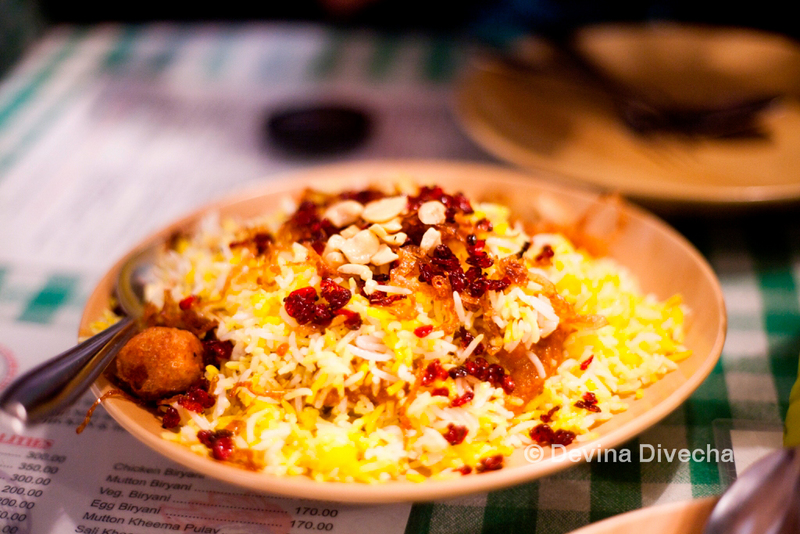 But in my opinion, it gives you a consistent and authentic taste of wholesome, hearty and delicious Parsi food. It was Valentine’s Day and I was in Bombay (Sorry folks, I still won’t call it Mumbai), and was spending the day with my friend, Shruti. “We MUST go to Britannia!” she said. “But I don’t know how to get there; we used to order it in from my office.” Right. Mission was to get there. My aunt helpfully said to get into a cab and tell them to take us to – and I swear, this is how she said it – ‘buhlaard’ estate. I soon figured out she meant “Ballard” estate. But she wasn’t saying it like this because her schooling had taken leave of her. I quickly realized that’s how the taxi drivers said it. I tried saying it how it should be said only to be met with blank stares. Off to Buhlaard Estate we went. After we finally found the place and entered, it’s as if you’re entering the old world of Bombay. The one left behind decades ago with the glitz and glamour of the city. 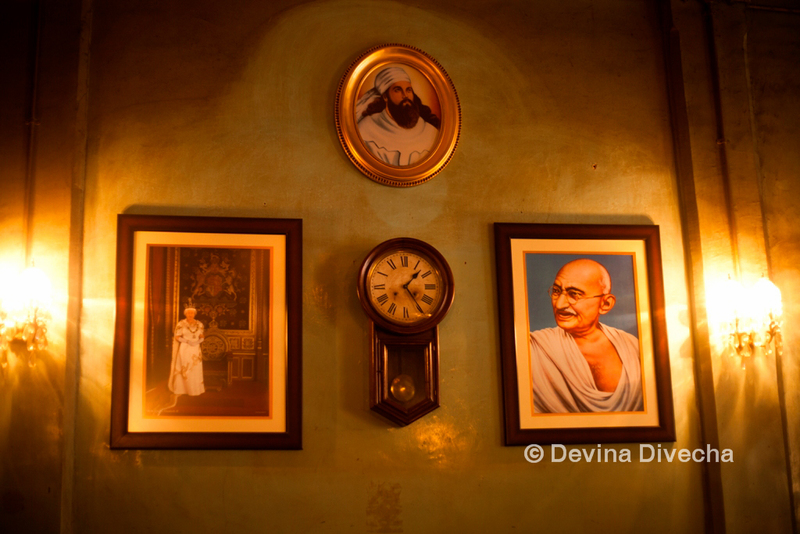 There are old, whirring fans, visible wiring, cracked paint, simple tables and chairs with checkered tablecloths, laminated menus at the table, portraits of Mahatma Gandhi and Queen Elizabeth II… you’re in Bombay of the yesteryears alright. 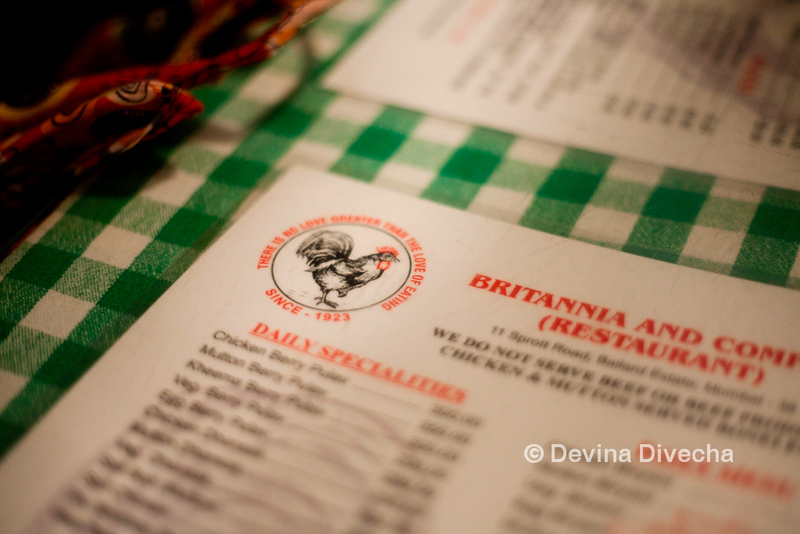 The menu is simple enough, but we knew there were staples of Britannia, dishes that had to be had…or else! I’d never been to Britannia before, even though I’d heard so much about it, but even I knew what was a must-have. Spicy Ginger for me, and Ice cream soda for Shruti. 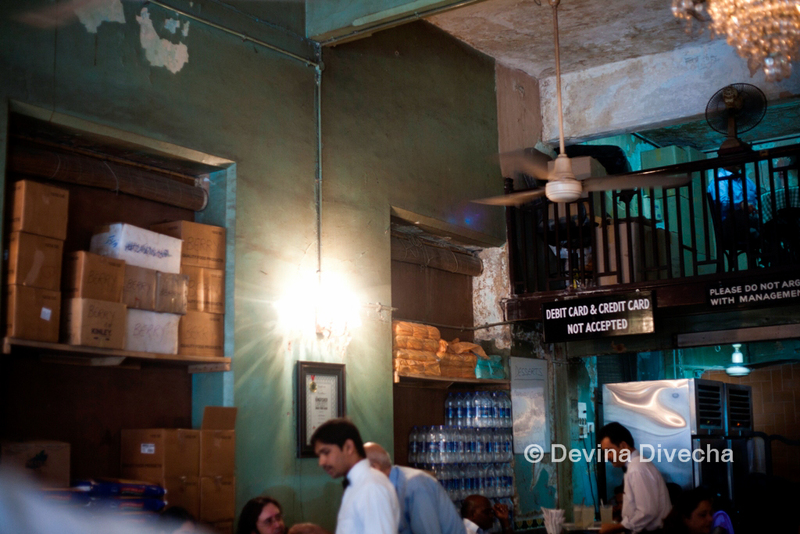 Mine was a proper hit of unadulterated ginger to my throat; just as well…I’d been down with a terrible sore throat that day (the after-effects of a wild sangeet night…but what happens at Cuffe Parade, stays at Cuffe Parade) and needed the ginger fix. Not for those who can’t handle spices. An old man shuffled to our table. With a wizened smile, he asked us for our order. We rattled off our dishes, and waited for him to write everything down in a shaky, but clear script. As he walked off, wishing us a good day, our hearts melted. We’d just met the owner, the very friendly and genial, Boman Kohinoor. He’s very much a part of the setting. During the time we spent there, he walked around, took orders and showed it really was a great family business. But wotcher…our food started coming in! The first up is the very famous berry pulav (we ordered chicken). 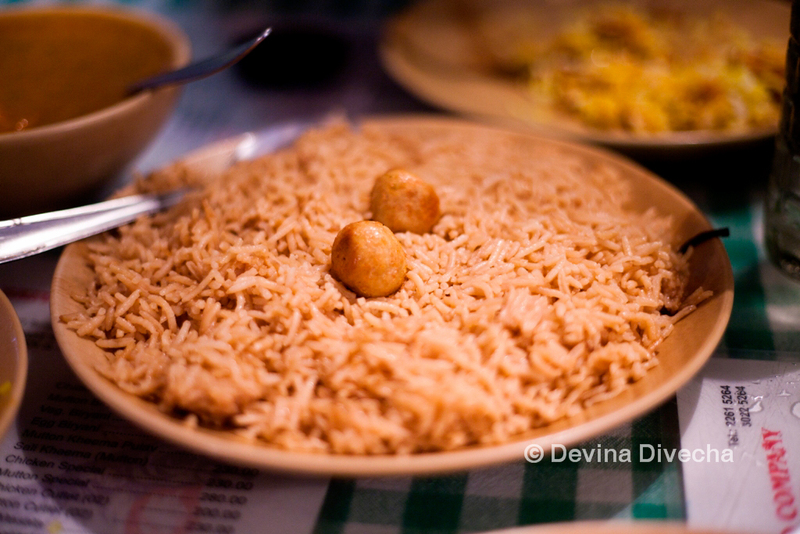 The berry pulav is an institution in itself. 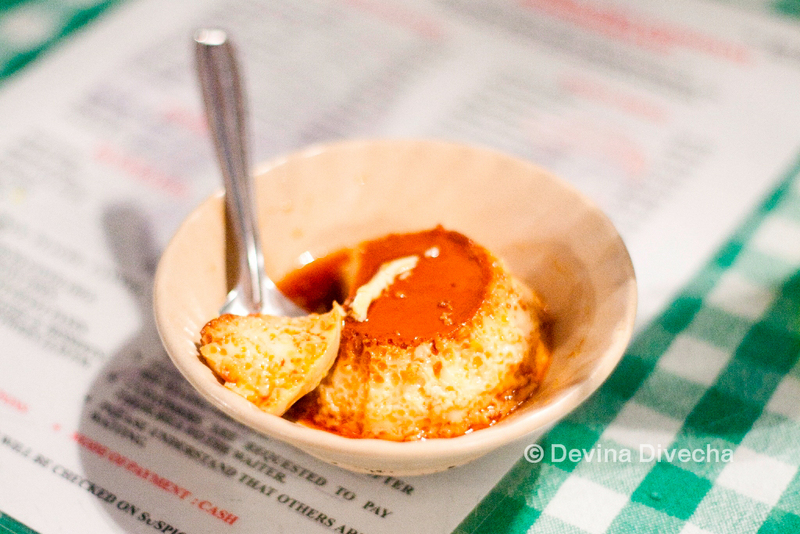 Bombayites, Mumbaikars…whatever you call them…will all attest to this dish. What is it? 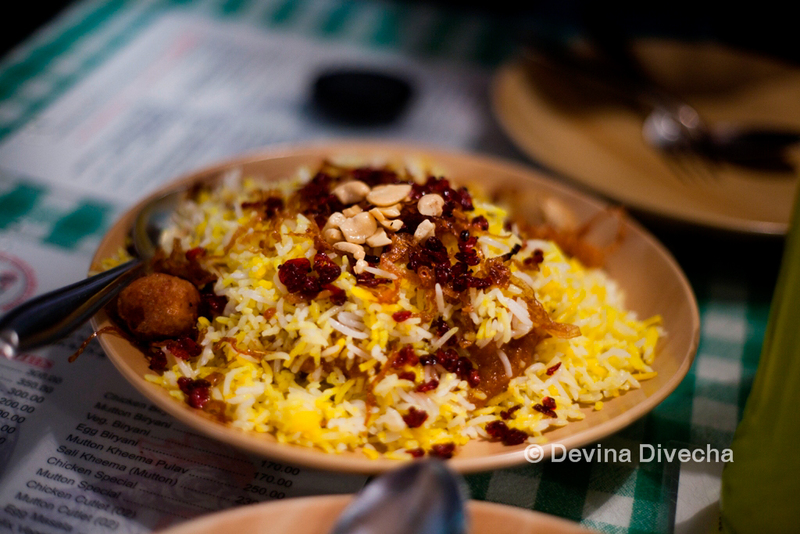 A bed of yellow/white basmati rice, with two round kababs on the side, a garnish of cashewnuts and fried onions, the meat and…the red berries. The combination of these ingredients make the flavours pop in your mouth, where the meat is cooked to perfection, the cashew nuts and onions lending a crispy take to the dish and the berries mixing sweet and sour all in one go. I fell in love. The berry pulav sates you. 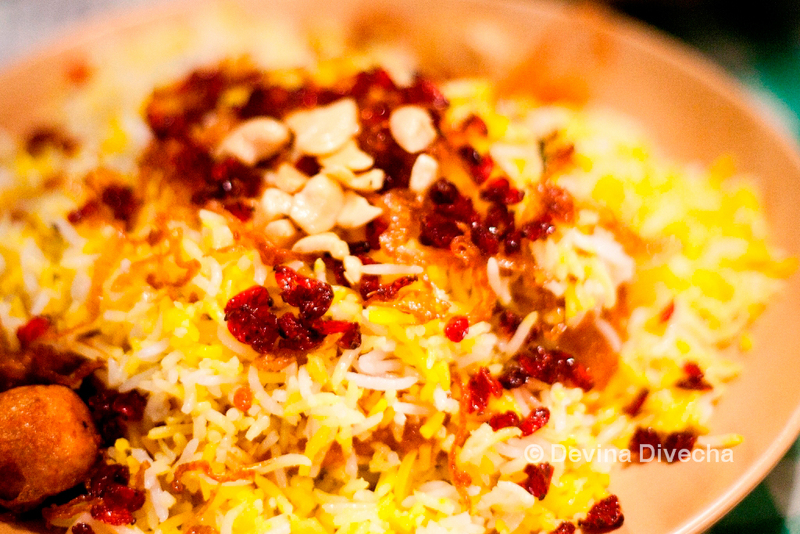 Research shows it was Boman Kohinoor’s late wife who introduced this dish to the menu with barberries imported from Iran for this superb creation. But we weren’t done…we wanted more! And so onward we went. Dhansak. From what I understand of it, it’s the Parsi form of dal. We ordered the chicken dhansak, which came accompanied with a bed of brown rice and two small kabab balls on top (I’m sorry Shruti I ate them all, they were just so good!). 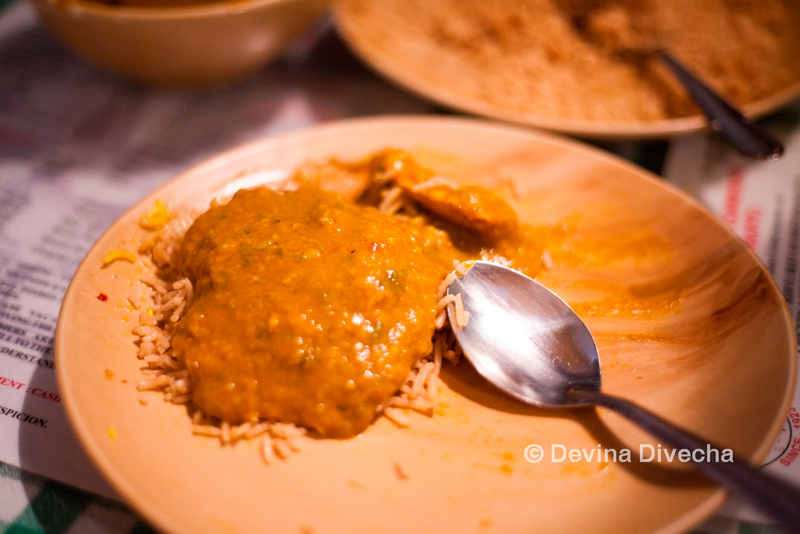 The dhansak itself is thick and hearty, and is something I’d love to have as comfort food if I could. It’s just that right level of warmth that infuses itself in the dish…when you have it, you know…you know THIS is what you could be having on a day of the sniffles, or the day you got ditched, or the day your parrot flew away. It may have been only two dishes were ordered, but both were filling. Filling I say, but not heavy. During this time, Boman Kohinoor ambled by to ask us how the meal was. I was busy stuffing my face and I’m afraid nothing intelligible was uttered by me, but Shruti was able to say that we indeed were enjoying ourselves. Stuffing my face aside, there was, is, and always will be, room for dessert. 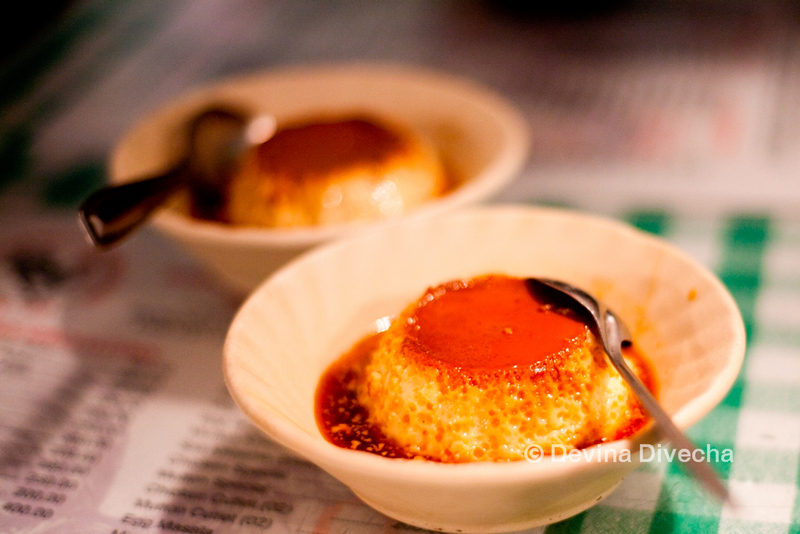 Parsi food has a famous dessert staple: caramel custard. What a treat this was! The consistency was excellent, as was the sweet level. Stars explode in your mouth when you eat this…I never thought of caramel custard as an exciting dish before, but Britannia has completely changed my mind on that front. You’d think we’d be done now that the meal was over. Nuh-uh. Shruti and I, armed with our rather large cameras, started taking more photographs of everything around us. I wandered around a bit, and when I came back, Shruti was being instructed by one of the Kohinoor family members to take more photos! Am I surprised? Yes. I’ve had experiences where I’ve been asked to stop taking photos, and experiences where, while no one has asked me to stop, staff members have been visibly uncomfortable with my camera. And here, it was refreshing to see we were welcome to snap away. …and then willingly posed for me with a trophy. And then when we were leaving, asked us to return with our boyfriends. “I don’t want to see you alone next time,” he said. Haha, while I can’t promise to get boyfriends along, I do promise to come with a bigger group of people, all food enthusiasts to partake in the restaurant’s simple, yet pleasing, fare. “There is no love greater than the love of eating,” so says the slogan of the restaurant above the logo of a black rooster. I beg to differ. 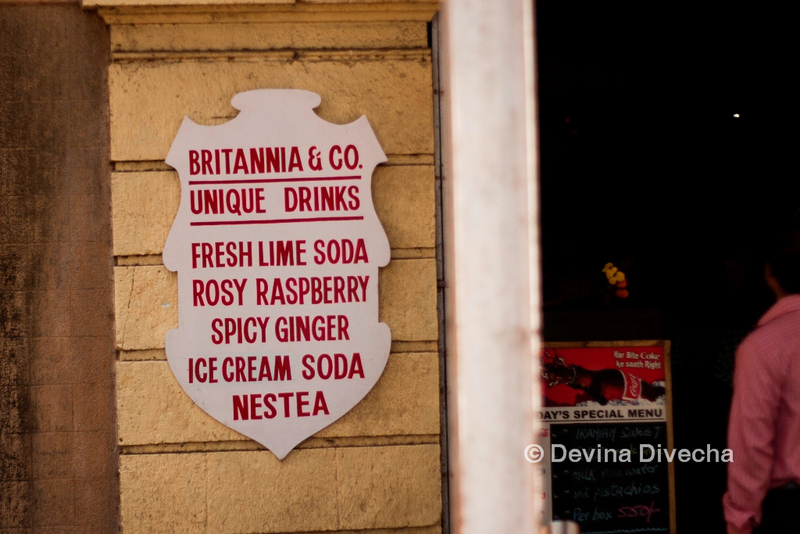 I found there is a greater love…and it’s for eating food at Britannia. Note: My one regret is noticing only after we left that I did not snap a photograph of Boman Kohinoor. I shall return. Also I didn’t try the sali boti and I definitely need to do that! Helpful tips: The restaurant is open ONLY FOR LUNCH. Get there between 11:30am and 3:30pm for your berry pulav fix, but not on Sundays. 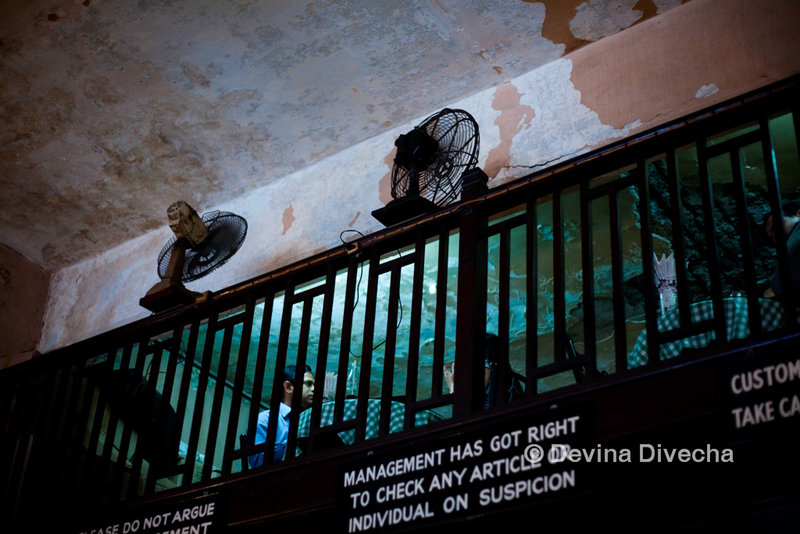 Get a taxi to Britannia; ask to go to Ballard Estate (say Buhlaard) and near the Mint House. Go with a massive appetite. 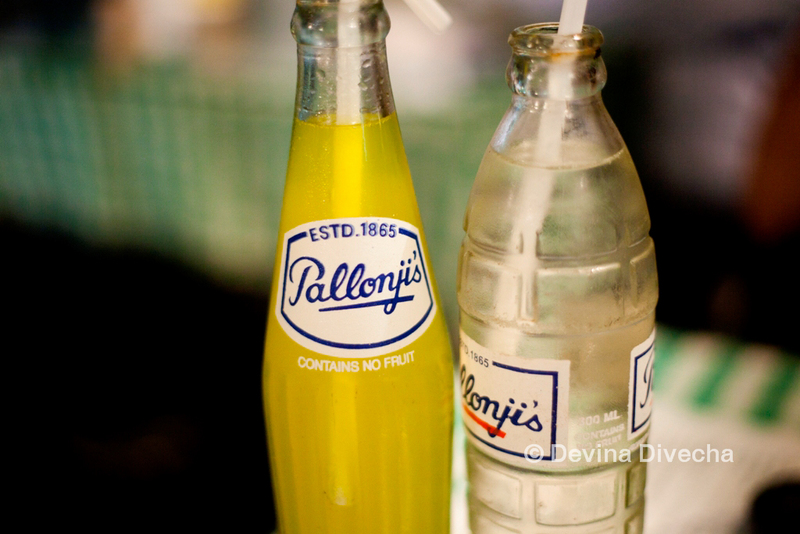 I love the glass soda bottles! And the “contains no fruit” label always makes me laugh. “Contains no fruit” Hahaha! Love it! Mishti said I should wait for her to go on vacay so that we can go together. Fancy to join us? gives me time to save monaaaay for the trip 🙂 I need to go with India food experts!!!!!! hahhaha “contains no fruit” yeah i cant seem to call bombay ‘mumbai’ either. Has always been will always be bombay for me.Where exactly in bombay is this devina? as in dadar? bandra? grant road? 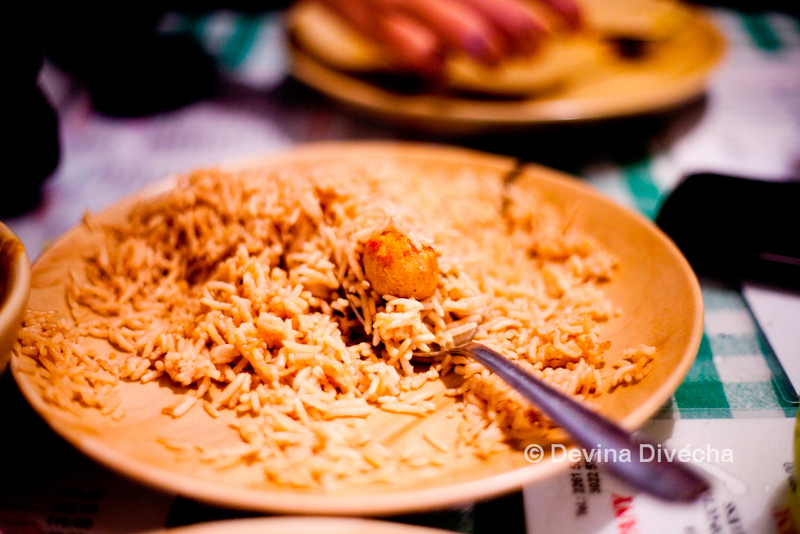 Didi – any excuse to go eat at awesome places in India for super cheap prices! I’m in.Drina – Yeahhhhh I think it’s the old ones like us 😉 We stick to old ways haha. This is near Fort. Previous Can you eat more than 70 dosas? Take up the challenge!